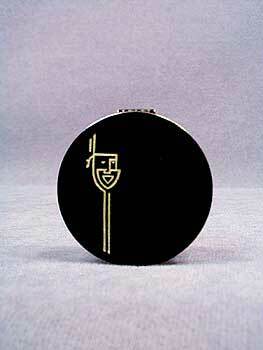 An ivory colored theatrical mask adorns the glossy black enameled top of this delightful Max Factor Society Make-Up Rouge compact. Made of brass, the back of the compact is fully marked, and "S99571" appears just above the hinge. The interior is fitted with a framed glass mirror, puff and full "flame" rouge pot. Measuring 1-5/8" diameter and 3/8" thick, this lovely little compact is in excellent condition inside and out.